I am in Italy at the moment, taking my holidays late this year, enjoying a bit of autumn sun on the Ligurian coast. I am here with my wife and two young boys, so it's not quite as relaxing as it may sound, with the kids not really having developed an understanding for the joy of relaxation yet. It is very enjoyable nonetheless, but not too much time for posting on the blog. Anyway, this post is not going to be about my vacation. I have a tendency to buy shoes when I travelling and this time proved to be no different. In the town of Alassio, I found a small shop with no more than a dozen different pairs of shoes for sale. One of these caught my eye, however, and I had to have them. This time it was a pair of handmade boots from Corvari. Corvari is a company representing quality and craftsmanship and thus, a company right to my liking. Being established in 1968 they have over forty years of experience in making shoes by hand from high quality hides. Their shoes are made in the Corvari factory in Montegranaro where the production of each shoe is started and completed without external involvement. 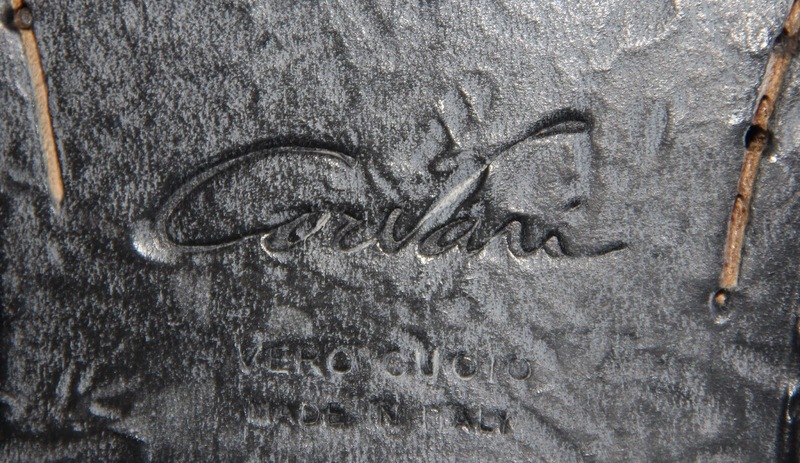 All Corvari shoes are sewn by hand. The finishing touches are put on fine pair of Corvari brogues. A little thing like the manually personalised insole is something I find very satisfying and I have great appreciation for. I think details like that show that they take pride in the shoes they make and that is what makes a great product. The beautifully created mark on the insole. It is difficult to show the leather quality in a photo but if you're willing to take my word for it, the leather used to make these boots is incredibly soft and, as a consequence, they feel as comfortable as possible on the foot. I think these boots will be perfect for the coming autumn, and probably for the coming years as well. I am actually looking forward to wearing these during the cooler months. Amazing article! I need individuals to know exactly how great this data is in your article. It's fascinating, convincing substance. Your perspectives are much like my own particular concerning this subject.for information regarding purchasing hand made shoes please visit to the link. Its an incredible joy perusing your post.Its brimming with data I am searching for and I want to post a remark that "The substance of your post is marvelous" Great work.for information regarding purchasing hand made shoes please visit to the link. Custom Packaging Boxes Printing Company delivers and makes quality packaging boxes, along with quality offset printing, digital packaging printing and design services to a full range of consumers.